Hopedale Builders is more than your builder. We’re your partner in turning your vision into reality. Experts in remodeling and renovation, Hopedale craftsmen bring a fresh perspective on each project that results in an exceptional experience. Hopedale Builders, straight to the heart of awesome. Your vision. Our expertise. Unlimited possibilities.
" A century of knowledge applied to craft" The Goodman family has been providing custom millwork to North Carolina architects, builders and interior designers for more than 100 years. We are known for our design and installation problem solving and our consistently high quality products. Today, millwork crafted by our 110-year-old company is found in the region’s finest homes and commercial establishments. Projects range from finely finished interior architectural details such as moldings, mantles and doors to extensive design-based renovation of custom kitchens, baths, home libraries, media rooms, entrance ways, stairways, and porches. Recently, we also have begun offering a broad line of products directly to homeowners for renovation or new construction, including the first of our Architectural Heritage Collection of handcrafted phone nooks and home storage cabinets – solid wood products with more than a hundred years of quality, service and creativity built in. Whether a new product or one that’s been part of our business for many years, each is custom-designed to harmonize with our customers' unique architecture and design styles. And, as you might expect, each has a great deal of time and care invested in it, which is why Goodman Millwork products sell for slightly more than mass market millwork -- a price premium that our many delighted customers perceive as an enduring investment when they see how our products have enhanced their homes’ comfort and appeal. So take your time and browse our projects. Consider the many creative approaches we’ve taken to both interior and exterior millwork projects. And then contemplate how Goodman Millwork may enhance your next renovation or home building project. Because our designs and product applications are limited only by your imagination. We appreciate you taking time to learn about our company. With over 35 years of experience, we strive to work closely with our clients to design and renovate Kitchens and Baths to best meet your taste and style. We offer a professional approach of larger showroom firms, without the high overhead, along with the remodeling & design experience, with the best value & personalized service of a smaller firm. Our philosophy is to keep our clients happy well after the sale. This may explain why most of our business comes from repeat customers and referrals. I have worked very hard to develop a business that serves people in a truly unique & personal way. My crew and I are committed to communication, excellence, and client satisfaction, which provide the foundation for a truly extraordinary experience. We would be honored to add you to our list of satisfied clients. I am confidant that we will exceed your expectations! Hans Krug brings the latest in style, functionality and design through a comprehensive solution for the interior of your home. We offer a wide variety of cabinet options with a multitude of finishes and material combination, to provide the most flexibility in your home design. There is no end to what you can envision from our award winning kitchen designs to our bathroom vanities, closet systems, wall units, tables and more. Visit our website (www.hanskrug.com); contact or visit our Showroom for more information. PLEASE NOTE: We are not a contracting company for construction or renovations services. Charlotte NC Showroom: The Village at South Park: 4310 Sharon Road, Suit U 01 in Charlotte, NC New York Showroom: 150 East 58th St 9th Floor NY, NY 10155. Please call us at (212) 355-4140 for more information. Boca Raton Showroom: 90 Glades Rd Suite A Boca Raton, Fl 33432. Please call us at (561) 409 2013. CONGRATULATIONS! You have just landed on the most important site for choosing your new stone countertops. Because of the vast variety of natural stone available today, fabricators now rely heavily on distributors who have an inventory of literally hundreds of stone choices. The distributors are all situated in about one quarter of a square mile just off I-77 at Westinghouse Boulevard. It is this concentration of stone supply that led Queen City Kitchens, formerly Imported Stone, to open our new showroom facility in the "heart of granite country". At Queen City Kitchens, we stock a nice selection of stone that we buy in bundles which allows us to offer you great stone at a great price. Should you want to consider additional options, our design expert will take you to visit the distributors to help you navigate through what can be an overwhelming selection. Recently we have observed that our customers have a significant interest in Quartz in addition to Granite. Queen City Kitchens is an approved supplier and fabricator of the leading manufacturers of Quartz, Silestone, Caesarstone and Cambria Quartz. We have a fabulous selection of Quartz products and are happy to explain why this rapidly growing choice for countertops is taking the countertop industry by storm. At Queen City Kitchens you can easily obtain access to as many stone samples as you have time to see. We have been the Number One fabricator choice for over 14,000 satisfied customers in our area for over nineteen years. Come into our showroom to see these beautiful surfaces and various alternatives, and rest assured you are in good hands with our expertise and quality workmanship! Call us now at 704.583.9992 or email us at qc@queencitykitchens.com to have a brief discussion about your remodel project. We will answer questions and see if a visit to your home for a free consultation will help you discover how to make your dream kitchen a reality. 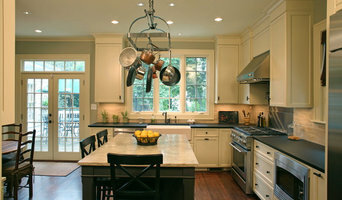 A few things to think about as you consider your remodel:•Are your going to change the current layout of your kitchen? •Are you adding or eliminating an island? •Are you planning to replace appliances? •Do you need any trade work completed to meet code specifications? •Are you keeping your existing floor? •Review you current design to determine what elements are working and where you would like to improve efficiency or functionality. Twisted Sisters Design, LLC has been pleasing clients at and around Lake Norman for over 15 years. We provide our clients services that include kitchen and bathroom design and renovations. The mother and daughter design/build firm provides client services that specialize in Kitchen and Bathroom remodels. 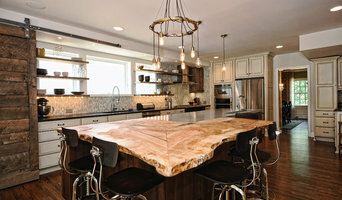 We provide the design, installation, and custom cabinetry. We are an interior and exterior design firm that provides a positive first impression and is built on a last impression, our ideas and designs stand to the test of time. Jennifer and Tatum Cornelius, designers, and the contractors work closely with the clients, the project is then completed with every expectation while fulfilling the client’s vision. Custom Crafted Kitchens & Baths design professionals and installation team are here to assist you through every step of your kitchen or bath project. As our client you will be able to work directly with a designer who facilitates in generating 3D drawings and pulling recommended selections together so that your space comes seamlessly together.